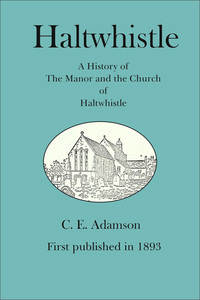 Originally published in 1893, Adamson’s book provides valuable information on life in Haltwhistle, a small Northumberland town, in the past. The text in this new edition remains true to the original. Changes to the font, layout, and general presentation make the work easier to read. Additional explanatory footnotes and a short biography of the author are also included. Subjects covered include the history, the church, market days, fairs, criminal behaviour, maypole customs, and pedigrees of De Ros, Musgrave, Carr-Cuthbertson, Bower, and Heron. Paperback: Book Depository, Amazon UK, Amazon US.